A tall topiary of Asiatic lily with paved orchids and freesia accented with apricots. 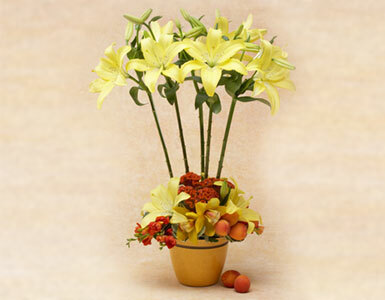 We specialize in yellow lily arrangements, yellow lilies, and yellow floral arrangements. We will have your yellow lilies arranged and yellow floral topiary delivered promptly to your home or office in Beverly Hills, West Hollywood, Santa Monica and greater Los Angeles area.